There are times when you need more than one artificial plant to bring a burst of life and color to your indoor or outdoor space. Thankfully, this artificial geranium plant is perfect for that! It contains three vertically stacked colorful baskets with red, yellow, and pink blooms poking out against the rich green leaves. Plus, it comes fully UV-resistant, making it perfect for that sunny spot in your sun room, kitchen, or even outdoors on your patio wall with other potted plants. 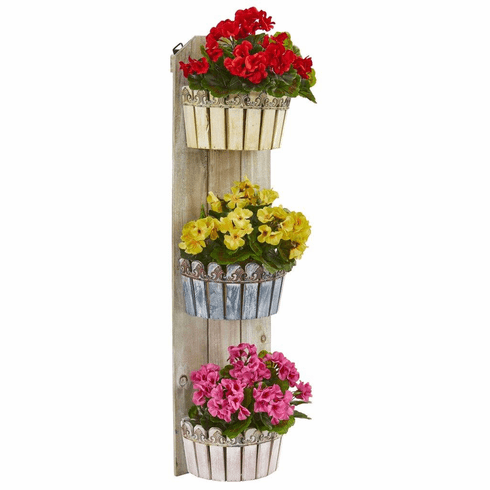 A wall decor planter with rustic appeal comes included. Height: 39 In., Width: 10 In., Depth: 10 In., Color: , Pot Size: H: 35 In. W: 10 In. D: 6 In.